The world is at a pivotal moment. As part of the U.N. Framework Convention on Climate Change (UNFCCC), countries are currently hard at work to create an international climate agreement by 2015 that can both respond to the growing impacts of climate change and drive a global shift to a low-carbon economy. There have been other attempts to do this in the past. The Kyoto Protocol of 1997, the Copenhagen Accord, and the Cancun and Durban decisions all were steps forward, but neither the level of emissions reductions achieved nor the international rules and norms established are up to the challenge of solving climate change. It’s clear that the new agreement must be different from the litany of past compacts, protocols, accords and decisions—but how? As the official negotiations have been underway, a small group of experts has quietly been thinking through these tough issues, conducting research and convening governments and stakeholders such as businesses, NGOs, labor and faith representatives and others around the world. Today, this group of experts, known as the Agreement for Climate Transformation 2015 (ACT 2015) partnership, releases Elements and Ideas for the Paris Agreement. The publication includes ideas on how various elements could be crafted to produce the strongest and most effective agreement possible. Here, we outline functions and core components to help design a new international climate agreement that goes further than any other previous plan. After figuring out what functions the 2015 agreement should fulfill, the next question is: What design elements would help achieve these functions? We found that three components are essential: long-term goals, a means to implement these goals, and transparency on the progress countries make. ACT 2015 puts forward two long-term goals. Countries have already agreed to ensure that global temperature does not increase more than 2° Celsius above pre-industrial levels in order to prevent some of the worst impacts of climate change. In the Paris Agreement, countries should include a more detailed mitigation goal. The world can stay within the 2°C target by phasing out all emissions to net zero as early as possible in the second half of this century. The second long-term goal must be to simultaneously reduce communities’ vulnerability to climate change impacts and build resilience. Of course, it’s also important that these two goals are achieved through actions that are fair, equitable and just. 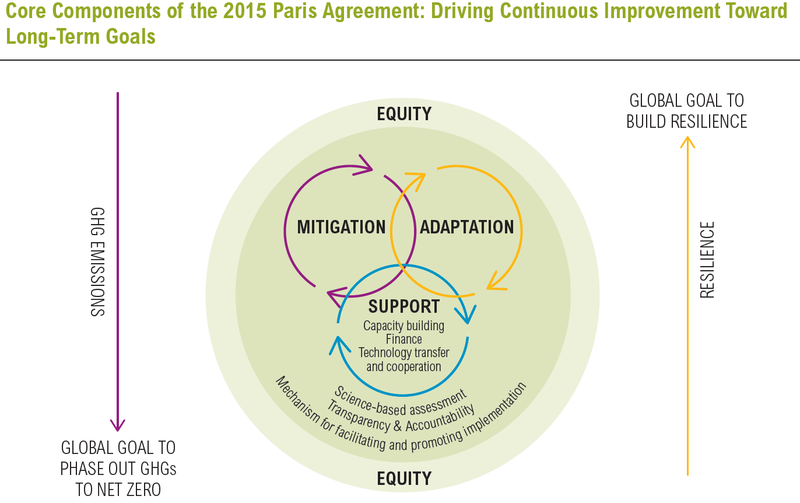 Countries can achieve these goals through three continuous cycles of mitigation, adaptation and support. Countries must put forward ambitious commitments to reduce emissions (mitigation), build resilience to the inevitable impacts of a warmer world (adaptation), and richer countries must enable poorer countries to mitigate and adapt, such as by providing finance or technology (support). It’s important that these commitments are strengthened over time, so ACT 2015 recommends creating “cycles of improvement,” where countries strengthen their mitigation, adaptation and support initiatives every five years.